From GOTHBOICLIQUE to James Blake, many artists in recent years have shown to be in opposition to joyous composition, substituting positive tracks with more melancholy tunes. “The study stresses that this gradual decrease in the happiness index does not mean that all songs in 1985 were happy and all modern songs are sad; instead, the findings only point to a general trend in properties of the music and the corresponding moods,” Complex pop culture writer Julia Pimentel said. But in no way is the industry in complete emotional turmoil as pop artists like Drake, whose music dictates night club culture, can still force hip gyration at a single note. However, it can be deduced that the music industry as a whole sounds like it’s been having a bad day, with some artists claiming this more than others. Singer-songwriter James Blake has never been one to shy away from speaking his mind, and after the anticipated release of his latest album, Assume Form, he once again rose his head above the publicity to make a claim. “If I can’t talk about emotions in music… If I can’t talk about those things, and I am anxious and I am depressed and I am sad, then what the f*ck else am I going to talk about?,” Blake said in an interview with Dazed. Expressing mental health problems is central to Blake’s discography and to that of many artists in last decade. 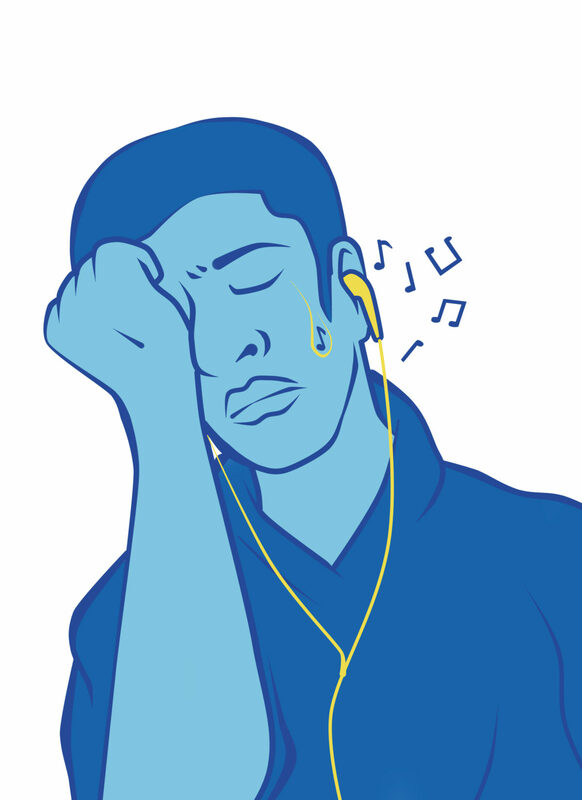 The recent plethora of sad music may be a preface to a bigger problem. Psychologist and University of Rochester graduate Danielle Guild contributes the recent rise of more personal, emotional music to a rise in many factors. “Technology isolates people, parent expectations have never been higher, money controls everything and job competition is only increasing. As a result, things such as music and TV tend to reflect this behavior,” Guild said. This isn’t the first time music has reflected societal challenges. Vietnam War and Cold War era musicians adversely accepted difficult times as bands such as The Beatles handed out peaceful messages and optimistic wishes. Highlighting the best of times during the worst of times was consistent throughout the world as well. Given its reputation for glorifying lavish-living rap music has shown a drastic change in subject matter as of the last decade. “For every rap song bragging about the glamors out newfound fame and riches, there’s a song about the hardships. Sometimes these songs glamorize the use of drugs, the need to carry a weapon or one night stands. Rappers who have been in the game long enough know this is merely a halo effect that can lead to paths of addiction and loneliness,” Medium writer Michael Beausoleil said. With rap subgenre “emo rap” taking an extended stay in the rap game, the genre has been lobbied by many artists. “Rappers are now more open than ever, and this gives them freedom to express themselves with less social influence. Listeners are still exposed to dangerous and harmful substances, but the lyrics advise them to proceed with caution. In this music, rappers have no shame in having feelings. In fact, it’s expected to have emotion,” Beausoleil says. Artists such as Bones and his collective, TeamSesh, similarly retained the “sad rap” sound. GOTHBOICLIQUE frontrunners Lil Peep, Wicca Phase Eternal Springs, Coldhart, Nedarb and many others rebranded “sad rap” to what is now considered “emo rap” with their formation in the mid 2010s. Though it was not until Lil Uzi Vert’s “XO Tour Llif3” did “emo rap” begin to infringe upon the mainstream sound. “In the song “XO TOUR Llif3,” Uzi raps about an argument with his girlfriend where she threatens to harm herself as a result of the emotional pain she’s feeling. Uzi, feeling that his relationship has gone to extremes, taunts that he only cares money now (hence the most recognizable line: “all my friends are dead,” referring to the dead presidents on dollar bills),” Beausoleil says.